The small medieval town of Valkenburg aan de Geul in the Dutch province of Limburg is characterized by history, living culture, and modern tourism. The main square is lined with buildings that are centuries old, which are under historical preservation, as well as boutiques, cafés, a river, and, since recently, a newly restored city gate. 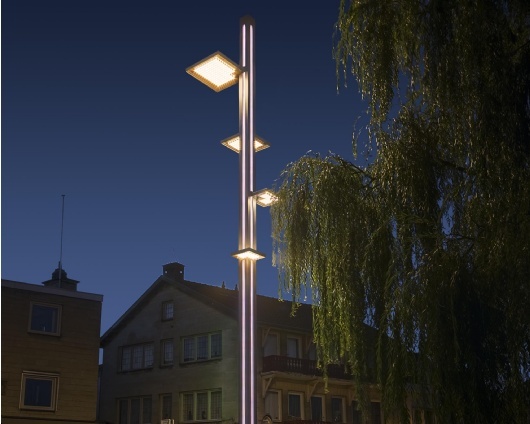 When it is dark, two pole-mounted lights from ewo provide the atmospheric setting. 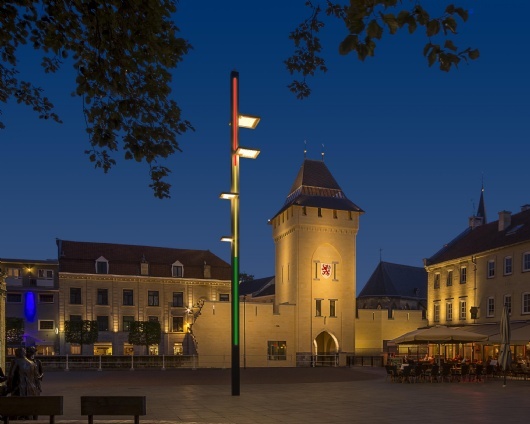 The poles are constructed from four square tubes with vertical lighting strips mounted between them. Four panels of different sizes which are mounted in an offset manner provide the basic lighting. The distribution and individual orientation of the LED lighting units that are contained in them are adjusted in such a way that even, non-dazzling light reaches every point of the square, regardless of the distance from the poles. Frosted lens optics and a reduced current feed contribute to the desired soft, understated illumination. The separate staging of the surrounding buildings is not affected. Different controllers and interfaces make it possible to give up this understating if the occasion requires it. LEDs are strung together in the vertical lighting strips on all four sides of the poles. They are controlled by means of the DMX interface and in that way can generate color effects or color gradients as desired. And the output of the basic illumination can be increased by several times as needed. The city has access to these functions by means of remote servicing. The combination of design, light quality, and additional functions was very convincing at the site. A third pole with the same construction method will soon be installed in the immediate vicinity of the square.